The past week or so was Eid el Adha, a Muslim holiday that honors the Prophet Abraham’s willingness to sacrifice his only son, Ishmael. The story goes that God commands Abraham to kill his son, and Abraham submits to God’s will—at the last minute, God intervenes and provides Abraham with a ram to sacrifice instead. Eid el Adha is a celebration of Abraham’s readiness to give up everything for God, his submissive nature regarding the will of God is something to be emulated. Ok, religious history lesson over. We all had a few days off of work because of Eid so I traveled around Israel and Palestine with some Fulbrighters. I had never been to Israel before, and I was incredibly excited to see the Holy Land. On the list: Nazareth, Jerusalem, Tel Aviv, Ramallah, and Tay Beh. I don’t want to address anything political in this post. The Israeli occupation of Palestinian territories is oft debated among the international community, written about in all kinds of news media, and has impacted the lives of thousands who live in what is known as the state of Israel. There are many online and print resources that address the topic, and countless places to read about the Israeli-Palestinian conflict—here is just a brief overview of Israel’s history that touches on some consequences of the UN’s vote to partition Palestine. All I can say is that there were places that felt like different worlds—namely spending Friday in Tel Aviv, then crossing over to Ramallah in the West Bank the next day. I saw some beautiful sights, and witnessed an incredible amount of diversity. There were moments I felt incredibly uncomfortable surrounded by Hebrew, a language I know nothing about (except the word ayykh, which means “what?”), and many others of slipping comfortably back into Arabic just in the span of a few hours. I spent entirely too much time trying to navigate hopping borders with our large group, but that was more than made up for by the abundance of delicious food and a slew of new inside jokes. Missed buses, good beer, interesting strangers, and lots of espresso accounted for the majority of our trip. Overall, it was a wonderful experience, and I’m happy for the opportunity to have seen something new and have heard even more stories. Anyways, I’ll be sure to post many photos in the coming days and weeks; they can probably do more justice to this experience than my words ever could. That is, if I can regain any semblance of productivity. Vacations always do that to me—I mean, incapacitate any attempts to do work. The intention is there, just not always the follow-through. It’s like when you sit down to send some purposeful emails or research job opportunities only to find yourself 30 minutes later looking at wedding dresses with a spoonful of Nutella in hand. Gah, my life. But I certainly digress. Yalla, pictures to come soon! WHERE HAS THE TIME GONE. Honestly, I can’t believe I’ve been here for almost two months. Finally, finally, things feel settled and fully in place. That’s probably the tenth time I’ve said that, but now I really believe it to be true. I have my schedule at AUM—I’m helping teach remedial English classes on Tuesdays and Thursdays, and have my office hours on Wednesday (office hours!). Teaching in Madaba has been fun, but the hour-long commute to and from school is a little rough at times. Many early mornings are spent just shouting at my phone’s alarm to stop it. Like, stop ringing. The sun isn’t even up yet, why am I? Why can’t I see properly? My eyes hurt. They hurt! These are the thoughts that run through my blurry mind at 5:30 am. Anyways, school schedule is set. I also go to the gym regularly. And clean my house regularly. In short, I am becoming the self-sufficient human being I only thought I was prior this jaunt in Jordan. With all these adult (ish) feelings and responsibilities, things are piling up a little bit–so thankfully there is an upcoming vacation from school for Eid el Adha. I am traveling with a group to Israel, which I am so excited about. All this to say that I will be going on hiatus until next week! Then, I’ll start posting things regularly, I promise. These next few days are just to get my act together and tidy up my brain, in a way. Yalla, more to come next week. Ajaneb = foreigners. We definitely attracted a hefty amount of stares, especially while driving through more remote towns in the Jordanian countryside. Some highlights of the trip were buying carpets in Tafilah, drinking tea on the edge of a cliff, befriending some Bedouins, seeing multiple shooting stars, and watching an incredible sunrise over the red desert. It honestly was the best weekend I’ve spent so far in Jordan, and what made it great was not the beautiful scenery along the way but laughing and making memories with some of my closest Fulbright friends. I can’t believe I just said “making memories” with zero irony. But, honestly, the entire time I remember feeling like this would be an experience that I would never forget. We assembled in Amman on Friday morning with just the idea of renting a car, and went from there. There’s something to be said for feeling safely independent while journeying across a country, and most of that has to do with the people who surround you. With any extended new and different experience, I think you have no choice but to let go of any pretenses and simply be yourself. Digging my fingers into the cool sand while looking up at an expanse of stars, I felt so genuinely content with both my circumstances and also the sense of renewed identity that is taking shape here. I’m being so sentimental, but I am saying this with complete sincerity: I love my life here. 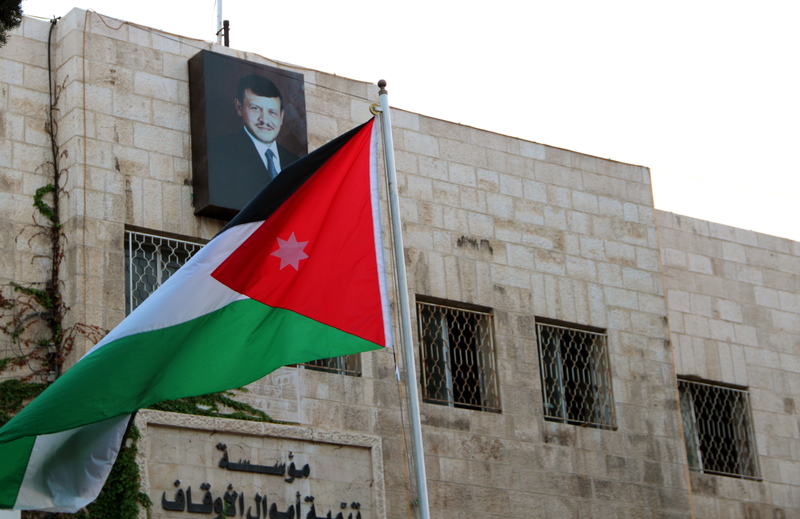 The Jordanian flag. Above it, a portrait of King Abdullah II. Photos of the king are everywhere here. I told you I would do one of these. So, here it is. If you’re reading this and have at least a shallow concept of who I am as a person, you’ll know that cooking is not something I really do. In two years of living in an apartment, I think I used the oven once and the stove about five times. Maaaaybe. Ok, ok–you get it. I’ll stop belaboring the point of my undomesticity. And I’ll stop making up words to describe myself. The point! The point is. 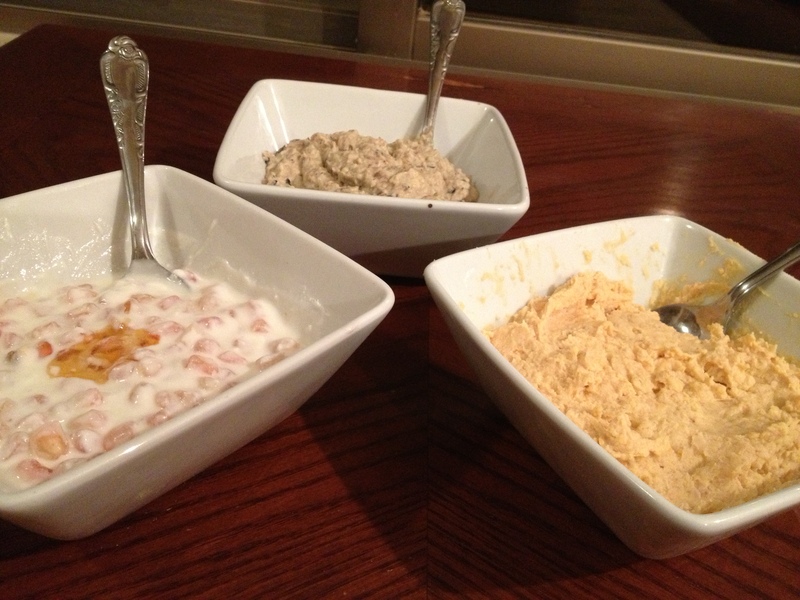 I’ve had success in making edible, Arabic food. 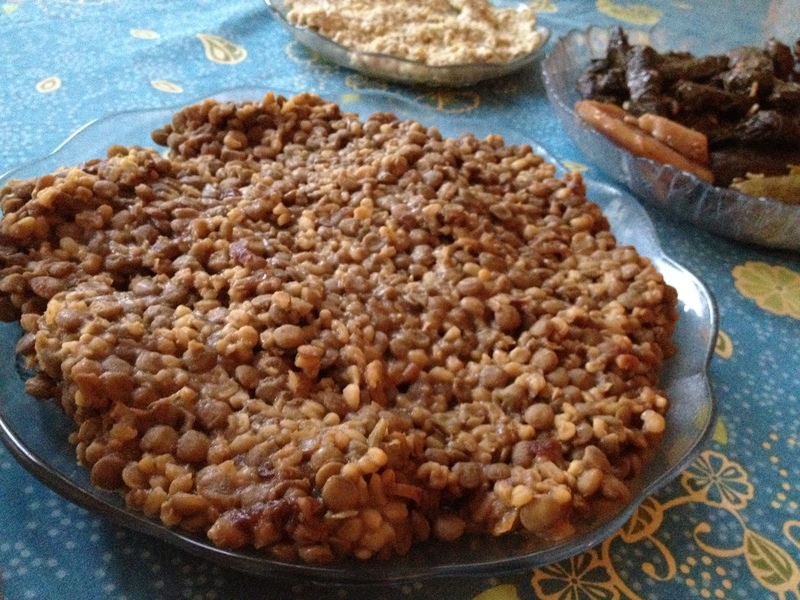 I cut an onion, boiled lentils, and made my mom’s recipe for mjadara. AND. This is my favorite thing ever. Fellow Fulbrighter Ryan graciously provided the ingredients and invited me over to make some mezzeh, small appetizer-like things, for dinner. On the menu was muttabal (roasted eggplant dish), hummus (not describing this), and finally a mix of laban (yogurt) and pomegranate seeds. For dessert, I made some cake. Incidentally, I was also the one that ate most of it. There’s no picture of that since it was basically just Pillsbury Devil’s Food cake out of the box, and you can probably guess what it looked like. This is Ryan, chef extraordinaire. 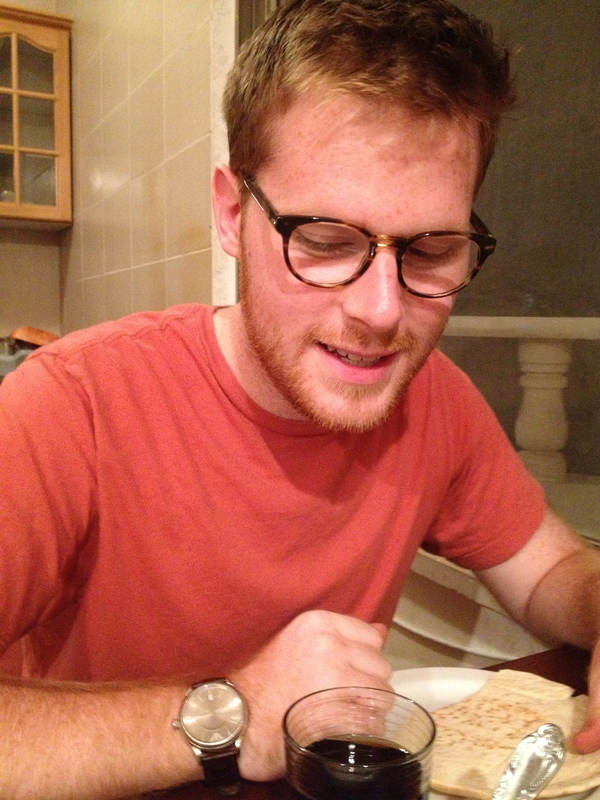 Also Arabic tutor extraordinaire. I’ll start posting more pictures of my friends, probably. Maybe more food pictures? Honestly, everything was very delicious, and this past week or so has made me more determined to follow up on my countless resolutions to cook more. On a daily basis, I still eat very simply. Eggs for breakfast, foul (beans with lemon juice) for lunch, and whatever I have the energy to scrounge up for dinner. Today it was leftover cake. Anyways, at least now I know that I am not a hopeless kitchen case! Here’s to many more culinary conquests, and incha’allah less solo cake-eating. Another throwback: Beirut. 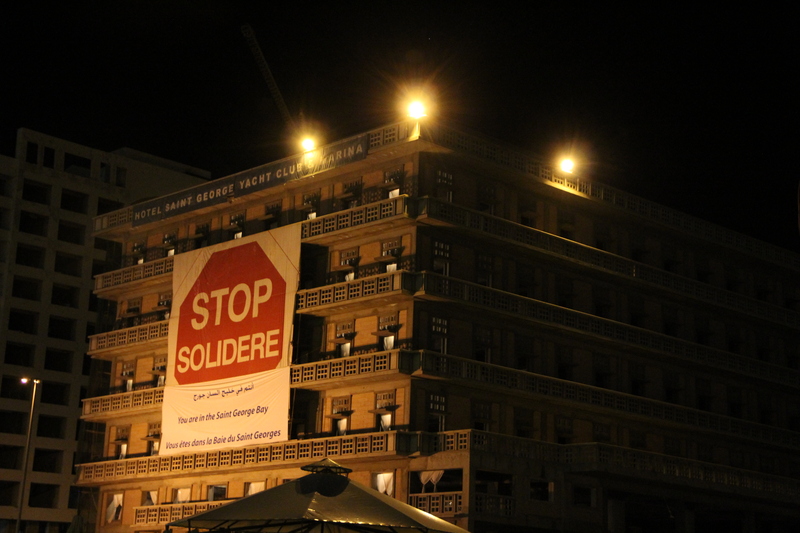 Solidere is a Lebanese company that is re-developing the city center. This blog has been lacking in updates. Life the past few days has been a little crazy–I started evening Arabic classes, school has begun at AUM (and so have my teaching duties…yikes), and I’ve been attempting to do things like cook and go to the gym. But khalas (enough) no more excuses, I will be posting things regularly in the next few days. In other news. Did you watch the video of all the Fulbrighters? Aren’t they great? I really like them all, I can’t think of a more dynamic group to spend a year with. Wallah I’m happy to know them.